Alstom has signed a contract for the delivery of 41 Coradia Lint regional trains. It will supply them to rail operator Transdev. The Transdev subsidiary Bayerische Regiobahn GmbH (BRB) will operate the trains on behalf on Transdev in the German state of Bavaria. Specifically, they will run on the lines between Augsburg and Weilheim, Schongau, Ingolstadt, Eichstätt and Langenneufnach. This contract is worth more than 150 million euros (170 million USD). Alstom’s Salzgitter site in Lower Saxony, Germany, will be responsible for manufacturing the Coradia Lint regional trains. The company is planning to deliver the rolling stock by September 2022. As a result of this contract Alstom can celebrate the production and delivery of its 1000th Coradia Lint train, making it the undisputed top diesel multiple unit in Europe. These regional trains have two 390kW engines and a top speed of 140km/h. 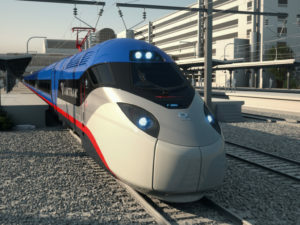 Alstom will supply them in a two-car configuration, which will provide seating for 125 passengers. There will also be a spacious area for storing bicycles. These trains furthermore improve on the existing fleet. Firstly, they have improved levels of comfort. And secondly, they are designed with the needs of passengers with reduced mobility in mind. This will allow all passengers to travel with as few constraints as possible.